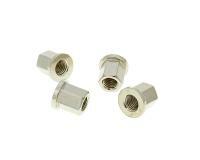 M7 threaded cylinder head nut, set of 4. 13mm long with collar. Suitable for all Minarelli, Kymco, MBK, Yamaha, CPI, Keeway engines with M7 cylinder studs. The nuts can of course be used for other purposes.